For Mother’s Day, make a special brunch and adorn the table with a cheerful centerpiece that Mom can enjoy for months. Ribbon topiaries don’t need water and are totally non-fussy. These DIY topiary centerpieces can easily be customized for other holidays or celebrations. Learn how to make your own Mother’s Day centerpieces below. 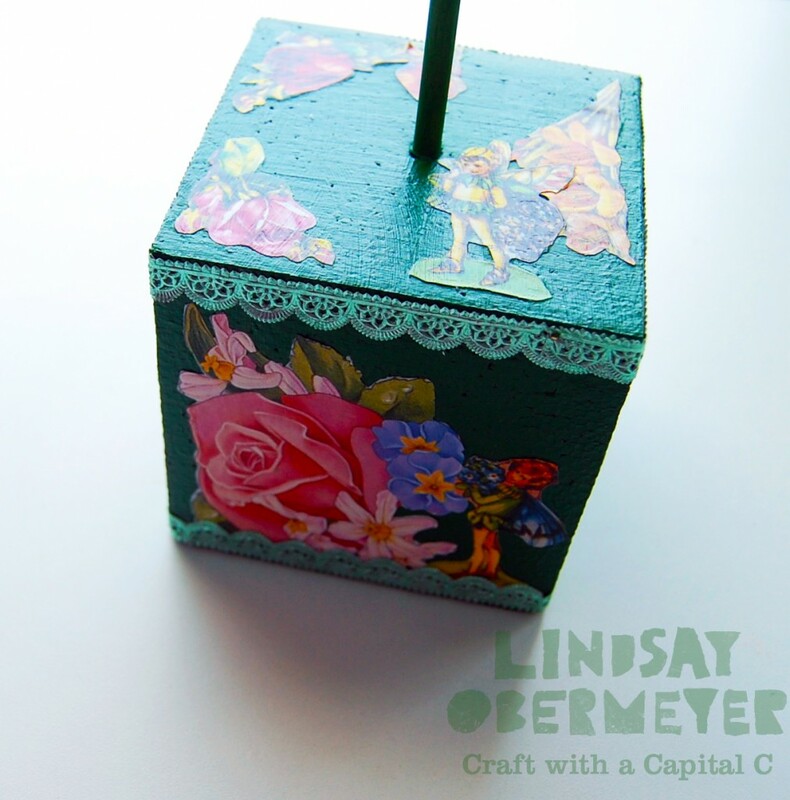 Paint the cube and dowel green, allow to dry. Collage favorite papers to the cube using decoupage medium, allow to dry. Brush glazing medium on the cube to protect your collage and give it a glossy finish. Allow to dry. Use the screwdriver or knitting needle to pierce a pilot hole into the Smoothfoam ball. Push the ball onto the dowel. Pierce another hole into the center of the top of the cube and push the dowel and ball inside. Cut several 2-3″ lengths of each color ribbon. 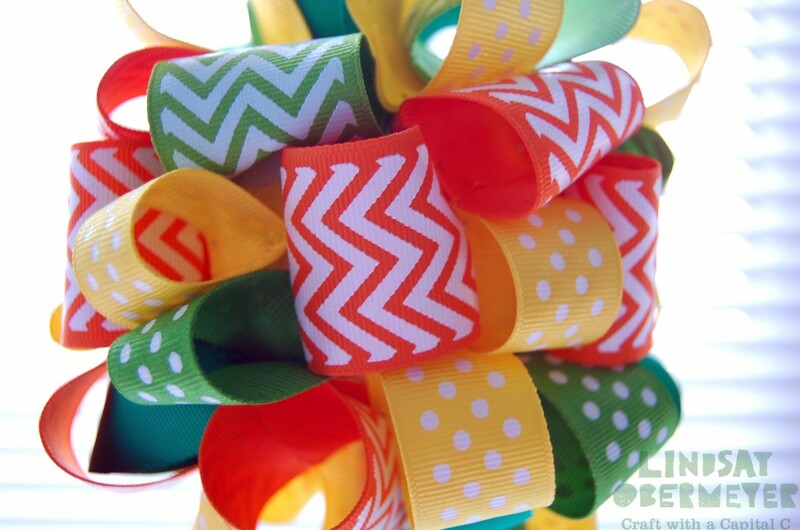 Roll each ribbon into a cylinder and pin it to the ball. I pinned a mixture of orange and yellow ribbons for blossoms, then I filled the spaces in between with green ribbon for leaves. 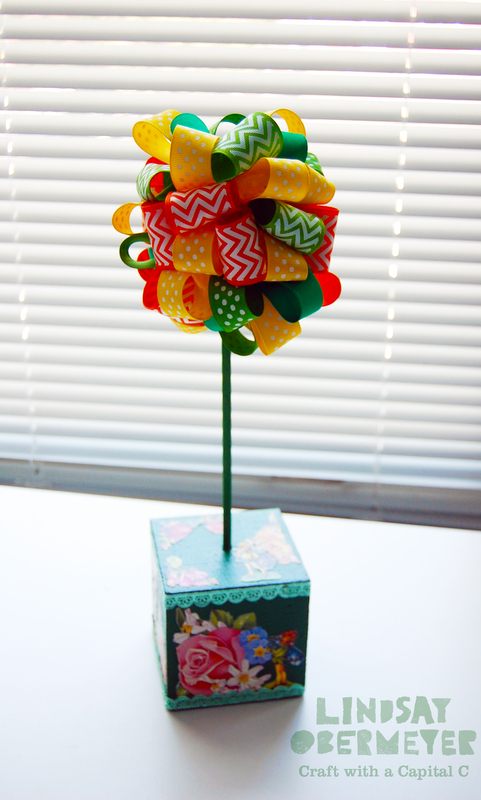 This entry was posted in Home Décor Crafts and tagged Ball, Cube, Flowers, Orange, Spring, Tabletop by Lindsay Obermeyer. Bookmark the permalink. I am an artist, designer, author and educator with a passion for the textile arts. A natural-born colorist with an eye for detail, I have been exhibiting my work in galleries and museums around the world for 25 years.